A Touch of Klez (ATOK) is a community band playing klezmer music in Ottawa . We began in late 1998 with Hazela Wainberg and a few musical friends gathering once a week to jam in Haze’s living room. 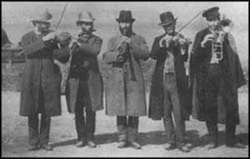 Gradually, the group changed its focus to klezmer music, adding musicians and repertoire.The band was first called the Negen Klezband and membership was a very “open” affair, with musicians coming and going almost with every rehearsal… more like a jam session in some respects. Haze particularly encouraged this arrangement, and many people had their first taste of playing klezmer music in Haze’s penthouse apartment. Membership and instruments have changed over the years. From 1999 until 2001, Haze was playing electronic keyboard, and occasionally melodica, Jacki Langsner played piano, Leonard Lefkovitch played violin and did most of the arrangements, Eric Elkin was on flute, Aharon (Ron) Zohar played accordion and clarinet, Leah Smith was a second clarinet, Robin Mader played viola, John Brockway bass (bass clarinet), and Harvey Steinwald did other percussion. Oonagh Elliot (Leonard’s daughter) playing guitar and Mark Richardson playing drums joined the group in January 2000. A few months later, Irwin (Ernie) Brodo joined the group on mandolin, Ruth Mendell joined on clarinet when Leah Smith left, and Lioudmila Kotova joined in November playing violin. Among the folks that joined for short or longer periods from 2000-2004 were Jonathan Kofman (violin), Isaac Musikansky (vocals and guitar), Lisa Miller (tenor sax), Brian Oelberg (flute), John (Five Eagles) Szuros (drums), Ron Backs (bass guitar), Alistair Rondeau (string bass), Ariel (Gingy) Arnoni (vocals), Debi Shore (dance animator), and Asher Farber (piano and sax). ​In March of 2000, after a rather chaotic performance at a Purim festival, the band was forced to reexamine its approach to rehearsals and performances. The band members decided to confine the jam sessions to certain planned dates (they were called “open rehearsals”), and put more emphasis on agreed upon “road maps” for each piece. Ron Zohar left the group and took the name of the band with him. By May, the group had adopted A Touch of Klez as its new name, both for its pun value and because the repertoire consisted largely of Israeli folk songs, traditional Jewish tunes and Yiddish theatre numbers, with only a touch of true klezmer tunes. In February of 2001, Sossy Weinman joined ATOK as a featured female vocalist, adding a number of Yiddish and Hebrew songs to the repertoire. (Jacki had performed some vocals before this, but only incidental to her piano playing.) When Sossy had to leave after the summer, Rena Herman came on board, not only as the lead singer, but also playing cello and, later, violin. By this time, vocals had definitely been established as part of ATOK performances. Rehearsals were held once a week in Haze’s penthouse apartment until she decided to move in late 2000. Fortunately, Hillel Lodge offered to provide rehearsal and storage space in return for the promise of regular performances at the Lodge for the residents. It was an ideal situation, and the band made the move early in 2001. The band scheduled four to six performances each year, usually coinciding with Jewish holidays. Haze also encouraged the Lodge residents to join in the singing and dancing by making the most active and dedicated folks “honourary band members,” complete with special band kippahs. The ornate kippahs were part of a costume that also included a rather heavy brocaded and embroidered vest that we discovered, years later, was Afghan ceremonial garb! Members of the band wore this costume at all performances from about 2001 until 2005, when it was mainly worn only at Hillel Lodge. Within a few years, the costumes were abandoned altogether in favour of simple white or black tops, often worn with a plain vest, and black slacks or skirt. The men in the band wear various kinds of hats or plain kippahs. The band continued to evolve with more changes in personnel. Dave Zinman joined in October 2002 to reestablish a drum section after Mark Richardson left (but Dave didn’t play regularly until a few years later), and Olly Wodin added her viola in January 2003 to provide a “middle voice” to the harmonies. Fred Brown came in about this time, following Al Rondeau, providing a much needed bass line now that Ron Backs and John Brockway had retired from the band. In February 2002, Leonard Lefkovitch was experiencing severe wrist pains and within a year, he felt that he had to leave the band entirely. His guidance and musicianship were sorely missed. Leonard passed away in 2010. The regular band members from 2002 until 2004 were: Eric Elkin, Ernie Brodo, Fred Brown, Lisa Miller, Harvey Steinwald, Hazela Wainberg, Jacki Langsner, Lioudmila Kotov, Olly Wodin, Oonagh Elliott, Peter Teitelbaum, Rena Herman, Ruth Mendell, Jonathan Kofman, Debi Shore, and John Szuros… 16 players in all, the band’s largest group. This is the group that performed at several major events: August 2002, at the SJCC, Concert for Peace; in February 3, 2003, at Centrepoint Theatre, in honour of Herb Gray’s 40th year of his career; February 8, 2003, in the Centrepoint Theatre, Adath Shalom Congregation’s Silver Anniversary; August 10, 2003, a Benefit, on George Street in the Byward Market; and October 11, 2004, Cummings Senior Centre in Montreal. When Haze moved back to Montreal in 2005, the band members underwent a major self-evaluation and decided to concentrate much more on a lighter sound, more polished performances, and a larger percentage of klezmer music, although adding some popular music by Jewish composers especially for non-Jewish venues. Don McVeigh joined with his banjo and mandolin, and, in 2006, Roselle Adler was added as a second violinist. The band trimmed down in size and it became easier to work out road maps with just one or two lead players, some harmony and solid rhythm and bass. When Dave Zinman and Roselle left to get married… to each other!,.. Steve Shapransky took on percussion. 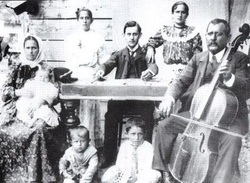 The ATOK repertoire remains extensive and varied, but is firmly based in traditional klezmer, including bulgars, shers, sirbas, freylachs, waltzes, klezmer horas, terkishes, and such, but often moves into Yiddish theatre, Israeli, Russian and Ladino songs, and even jazz and pop tunes (by Jewish composers) for certain occasions. The band members constantly challenge themselves with new and sometimes difficult music. Each summer several of them participate in KlezKanada (summer in the Laurentians) and/or Klez Kamp (winter in the Catskills), where they learn new melodies and techniques. A Touch of Klez takes pride in being a true community ensemble. It performs regularly at The Bess and Moe Greenberg Family Hillel Lodge, where the band is provided with free rehearsal space. In addition to the performances at the Lodge, the Monday night rehearsals provide an opportunity for residents to hear klezmer music regularly, and some come down to join the musicians as an ad hoc audience, ignoring the frequent starts and stops (and experimentation). ATOK has performed at other seniors’ residences, including Rideau Gardens, Central Park Lodge and Carleton Lodge. (Although the majority of the residents are not Jewish, they participate in the singing and dancing with great enthusiasm.) For the past several years they have played for the general public at Ottawa’s Tulip Festival as well as at Westfest in Westboro. In 2003, as mentioned before, the band undertook a very successful Concert for Peace, raising thousands of dollars to aid Israeli victims of terror. They participated in a fundraiser for Magen David Adom and in an Inter-Faith Concert for Peace in 2003, and have twice travelled to Montreal to play at the Cummings Senior Centre. Since 2008, they have provided the music for a community-wide klezmer dance evening as an annual fund-raiser on behalf of the Kosher Food Bank organized by Adath Shalom Congregation, and sponsored by most Ottawa synagogues. They also play for synagogue events and, for a negotiated fee, at private parties, weddings and bar and bat mitzvahs. A Touch of Klez expresses its gratitude for the support it receives from Hillel Lodge, Ottawa Jewish Community’s senior residence.